We all cook and bake with brown sugar, but have you ever wondered what makes it brown? The answer is actually simple—brown sugar is made of crystalline sucrose combined with a small amount of molasses, which is responsible for its characteristic color and rich flavor. Since molasses is hygroscopic (able to absorb water), brown sugar and the baked goods made with it retain moisture well. Brown sugar also contains a slightly higher mineral content than regular refined white sugar, due to the presence of molasses. Brown sugar is used very similarly to granulated white sugar, but it provides a touch of extra flavor. Common uses for brown sugar include sweetening baked goods, beverages, sauces, and marinades. Some varieties of natural brown sugar are also used to make alcoholic beverages like rum. Thanks to the granules and slightly acidic pH, brown sugar has also become a popular ingredient in body scrubs. Depending on the variety of brown sugar, molasses is either added back to refined white sugar or left intact with the sugar crystals during the refining process. The amount of molasses will determine the sugar's shade of brown. 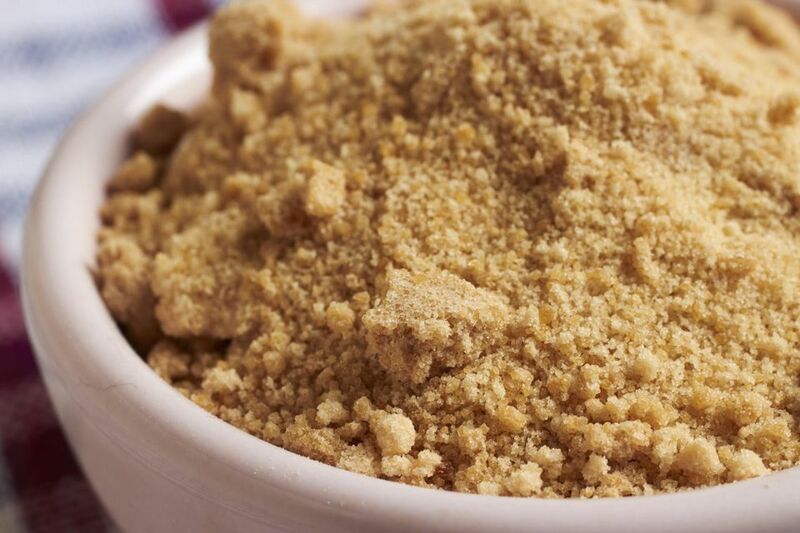 Light Brown Sugar: This is the most common type of brown sugar used for baking. Recipes that call for brown sugar without specifying either light or dark generally require light brown sugar. Light brown sugar contains approximately 3.5 percent molasses by weight. Dark Brown Sugar: Dark brown sugar is approximately 6.5 percent molasses by weight and is used when an extra rich flavor or color is desired. Sugar in the Raw: This is a natural brown sugar, which still contains the residues of molasses left over from the refining process. The sucrose crystals are generally slightly larger and the sugar is less moist in texture than regular commercial brown sugar. Other varieties of natural brown sugar include Turbinado, Muscovado, and Demerara. Liquid Brown Sugar: Domino Sugar, a predominant sugar manufacturer in the United States, used to produce a liquid brown sugar product. Although the product is no longer available, many older recipes still include this ingredient. To make a substitute for liquid brown sugar at home, combine one part water with three parts light brown sugar. The mixture may need to be heated slightly for the sugar to fully dissolve. Brown sugar can be prepared at home by combining one tablespoon of molasses for every cup of granulated white sugar. Stir the sugar and molasses together until an even color and texture are achieved. Store the brown sugar in an airtight container. Brown sugar must be kept in an airtight container in order to retain its moisture content. Brown sugar exposed to air may harden as the moisture slowly evaporates out. Hardened brown sugar can be softened by adding a slice of bread or an apple wedge to the container and sealing it tightly. Within a few hours, the molasses will have absorbed some of the moisture present in the bread or apple and the sugar will be soft again.